[S3] Marlene A. Eilers, Queen Victoria's Descendants (Baltimore, Maryland: Genealogical Publishing Co., 1987), page 159. Hereinafter cited as Queen Victoria's Descendants. [S7625] Royal Musings Blog Spot, online http://royalmusingsblogspotcom.blogspot.com. Hereinafter cited as Royal Musings Blog Spot. Christian Prinz von Hannover was born on 1 June 1985 at Hildesheim, Niedersachsen, GermanyG.1 He is the son of Ernst August Prinz von Hannover and Chantal Hochuli. He married Alessandra de Osma, daughter of Felipe de Osma Berckemeyer and Elizabeth Foy Vasquez, in November 2017 at London, England. Isabella Gräfin von Thurn und Valsássina-Como-Vercelli was born on 12 December 1962 at Klagenfurt am Worthersee, Austria.1 She was the daughter of Ariprand Raimund Georg Alexander Maria Josef Lucas Fortunatus Graf von Thurn und Valsássina-Como-Vercelli and Maria Perpetua Euphemia Prinzessin von Auersperg. She married Ludwig Prinz von Hannover, son of Ernst August IV Prinz von Hannover and Ortrud Bertha Adelheid Hedwig Prinzessin zu Schleswig-Holstein-Sonderburg-Glücksburg, in September 1988. She was also reported to have been married on 4 October 1987 at Bleiburg, Carinthia, AustriaG. She died on 29 November 1988 at age 25. She was buried on 2 December 1988 at Grunau, AustriaG. Otto Prinz von Hannover was born on 13 February 1988. He is the son of Ludwig Prinz von Hannover and Isabella Gräfin von Thurn und Valsássina-Como-Vercelli. [S12] C. Arnold McNaughton, The Book of Kings: A Royal Genealogy, in 3 volumes (London, U.K.: Garnstone Press, 1973), volume 1, page 189. Hereinafter cited as The Book of Kings. [S12] C. Arnold McNaughton, The Book of Kings, volume 1, page 186. 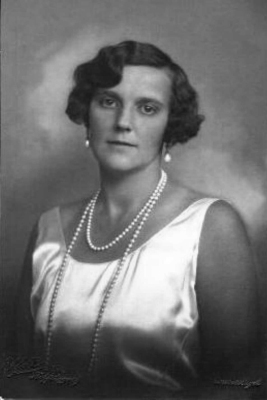 Margrethe Françoise zu Schleswig-Holstein-Sonderburg-Glücksburg, Princess of Denmark was born on 17 September 1895 at Bernstorffshoj, DenmarkG.3 She was the daughter of Waldemar zu Schleswig-Holstein-Sonderburg-Glücksburg, Prince of Denmark and Marie Amélie Françoise Hélène d'Orléans, Princesse d'Orléans.4 She married René Carlo Maria Guiseppe di Borbone, Principe di Parma, son of Roberto I di Borbone, Duca di Parma and Maria Antonia Adelaide de Bragança, Infanta de Portugal, on 9 June 1921 at Copenhagen, DenmarkG.3 She died on 18 September 1992 at age 97 at BrodrejojG. [S12] C. Arnold McNaughton, The Book of Kings: A Royal Genealogy, in 3 volumes (London, U.K.: Garnstone Press, 1973), volume 1, page 90. Hereinafter cited as The Book of Kings. [S12] C. Arnold McNaughton, The Book of Kings, volume 1, page 451. Friedrich Franz V Erbgroßherzog von Mecklenburg-Schwerin was born on 22 April 1910 at Schwerin, Mecklenburg-Vorpommern, GermanyG.2 He is the son of Friedrich Franz IV Michael Großherzog von Mecklenburg-Schwerin and Alexandra Luise Prinzessin von Hannover.1 He married Karin Elisabeth Henriette Lori Gudela von Schaper, daughter of Walter von Schaper and Isa Münchhausen, Baroness Münchhausen, on 11 June 1941 at WiligardG.2 He and Karin Elisabeth Henriette Lori Gudela von Schaper were divorced in 1967. [S11] Alison Weir, Britain's Royal Families: The Complete Genealogy (London, U.K.: The Bodley Head, 1999), page 292. Hereinafter cited as Britain's Royal Families. [S12] C. Arnold McNaughton, The Book of Kings: A Royal Genealogy, in 3 volumes (London, U.K.: Garnstone Press, 1973), volume 1, page 417. Hereinafter cited as The Book of Kings. [S12] C. Arnold McNaughton, The Book of Kings: A Royal Genealogy, in 3 volumes (London, U.K.: Garnstone Press, 1973), volume 1, page 95. Hereinafter cited as The Book of Kings. [S3] Marlene A. Eilers, Queen Victoria's Descendants (Baltimore, Maryland: Genealogical Publishing Co., 1987), page 189. Hereinafter cited as Queen Victoria's Descendants.